Wring, wring go away, come again next February! The view on my street, 5:30 a.m. this morning. This weather is getting really old. The junior member of the firm invented a new word for the season we’re stuck in–wring, as in winter and spring mashed together. I like the sense of fatigue and disgust inherent in the word wring–that’s about where most of us are in northern Colorado this morning. 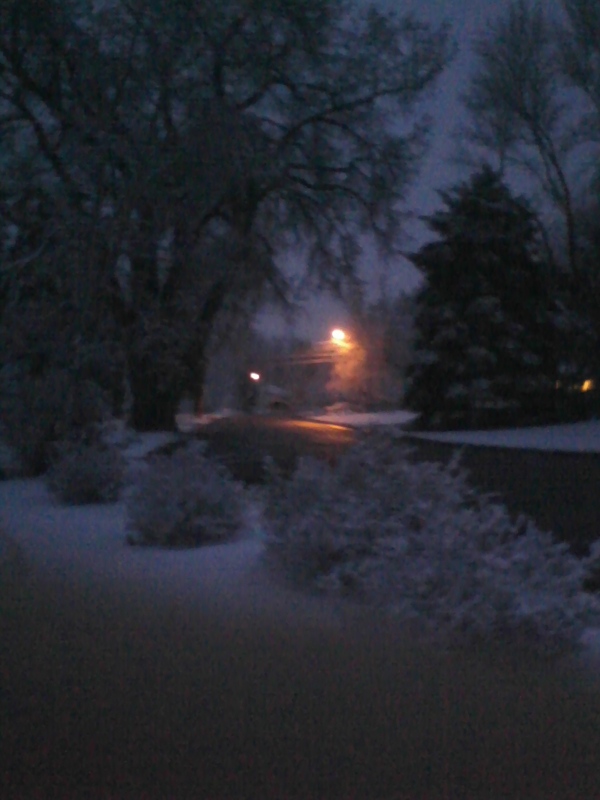 The photo on the left is what my street looked like at 5:30 a.m., when I went out to get the newspaper. 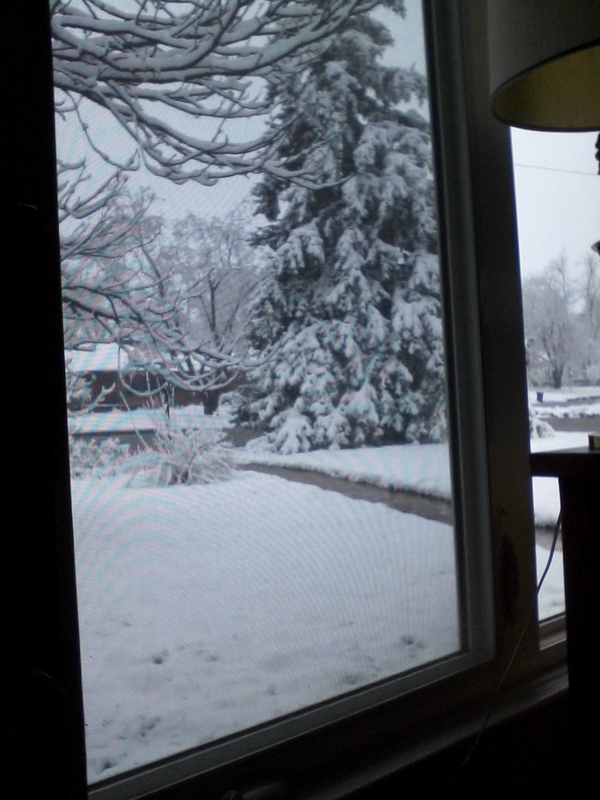 The photo on the right (below) is the view outside my home office window. All together now: Awesome!!! The only thing wring has to recommend it is that we don’t have to shovel or plow the snow–it melts on contact with the already-warmed streets, driveways, and sidewalks. I sympathize. I often see snow for May first or my birthday, mid-month, but I live in Canada. Not fair for you! The local usage is “sprinter,” but it’s the same idea. HA-ha. Sprinter is good, but that seems too cheerful right now. Wring captures the right mood, I think. Come down south to Charleston! Not only do we have great weather, but my district is about to say a big “no thank you” to a family-values, philandering idiot and elect our first Democrat in years! In DC, the winter was too long, but it’s gone. Spring arrived disguised as summer. I love San Diego; it’s a real compromise – no seasons just nice and warm. One of the coldest days I ever remember was a May 1 in Albany, NY, but at least it was bright. I like snow as much as anyone, and I don’t even mind the occasional spring freakout, but it does seem like the western end of the flat is getting “wringed-out” badly this year. My empathies, to everyone except for the golden trout! Here in Texas we are expecting a high of 42 on Saturday??!?! Could be worse- we’re in sumter (wimmer?). Today was 85, but this weekend it’s supposed to snow. Condolences! Your weather is making me think of Laura Ingles Wilder’s Long Winter. Funny you should mention that, Katherine–just yesterday while snowed in, I had to grind up my own wheat flour in my coffee grinder! Fortunately, the electricity was only out for 20 minutes or so, so it was light work. As Frat Guy points out: water. My older son was born in early June in northern Utah, and it snowed the week after his birthday more than once. Plus, I never did learn to wait long enough to put in plants. My petunias froze in May every year we were there!